Jesse Ferguson's life was forever changed the night his SUV careened off a rural road in the County of Brant during a late-season snowstorm in April 2005. He was in a coma following the accident. When Ferguson finally woke up, he couldn't walk and couldn't talk. In his own words: "My life as I knew it was thrown to the wolves and my abilities were stolen away. All the doors I had open to me prior were slammed shut." Ferguson had suffered an acquired brain injury (ABI), defined by the Toronto ABI Network as damage to the brain that occurs after birth and may be caused traumatically by great external force such as a collision. The effect of acquired brain injuries vary greatly from individual to individual. They can impact both physical and mental capabilities and no two people who suffer an acquired brain injury can expect the same outcome. In Ferguson's case, the injury presented life-altering challenges, a long road to recovery and the prospect of coming to grips with a new reality. "It's like living your life at half-capacity – something big is missing," Ferguson said. "I guess it's kind of like playing hockey always down two men, which is a significant disadvantage. My life is impacted in every way and everything is severely compromised." While speech and mobility still present challenges for Ferguson, he made a remarkable recovery that saw him defy the odds and walk again, something doctors said would never happen. And, while rare in someone who suffers such a severe head injury, Ferguson's mental capabilities remained as strong as ever following his accident. Through each step in his recovery, he has been determined to live life to the fullest. That sense of determination led Ferguson to begin studying journalism and contemporary studies at Wilfrid Laurier University's Brantford campus in 2008, an experience that started opening some of the doors that had been shut following his accident. An avid sports fan, Ferguson decided on journalism due to his strong interest in sportswriting. 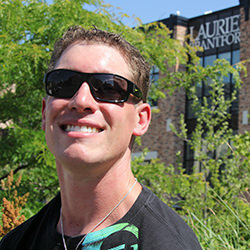 With the Brantford campus a short 15-minute drive from his home in Burford, Laurier was the perfect fit. "The great thing about my time at Laurier was that almost every instructor was great to me, accepted me and made it easier for me to be successful," he said. "Those profs who allowed me the chance to work with them and design solutions – for example, creating a substitute for oral presentations or finding a way that I could write tests with the class – meant the most to me because I didn't want to be stranded in isolation from my peers. I wanted to be included in all situations, not excluded." During his time at the university, Ferguson received assistance from Laurier's Accessible Learning Centre, which serves to assist students with disabilities reach their full academic potential. During the past year, the centre has helped more than 1,500 students. "It was a difficult period for me to get through various challenges physically, but I always found my way," Ferguson said. "Laurier and the community of Brantford both contributed to that happening." Since graduating from Laurier in 2013, Ferguson has become an advocate for spreading awareness about ABI, what he calls an "under-reported" condition. As part of his efforts, Ferguson recently told the story of his accident and recovery in a well-received four-part series of articles for Metroland Media. He's also working on a book about his experience. It's work he says he wouldn't be doing if not for his time at Laurier. "My studies completely moulded me for the journalism work I do now," Ferguson said. "I always thought I could write, but my studies showed me the right way to do it – and how to make the most of my skills. As for the advocacy, my studies at Laurier enlightened me that different ways of life do exist and there were similarities I could draw to my own life, which I think enabled me to advocate." In addition to his advocacy work, Ferguson has also written for sports news websites and his hometown newspaper since graduating from Laurier. During his down time, he's at the gym, riding his bicycle or getting together with friends. Now, more than a decade since his accident, Ferguson sees his work raising awareness about ABI as more than work: for him it's a duty. "I know the depths of this injury, so the advocacy is making things fair for people like me, who I know too often get overlooked and straight-up denied for the effects of their injury," Ferguson said. "I do know what it's like. Out of blind disrespect given to some ABI survivors, I want to even the playing field and give them a voice – and to give people who may judge some pause." Ferguson also hopes people will find inspiration in his story, as well as the example he has chosen to set. "People can learn from my experience that you can bounce back from anything and still make a life out of it, no matter the depth of the plight," Ferguson said. "I feel accomplished, that following such a drastic injury I came back from the depths. Even with the limitations and stigma, I have risen above it and made a great life." Ferguson offered one more key factor that has helped him find courage and strength through his recovery, healing and the sharing of his story.